Keep up to date with what's happening at Dartes and performance swimming in Doncaster. This page records the news as it happens -- history in the making! 28 Feb: Weekend number 2 at Age Group Yorkshires saw more fine performances from an on form Dartes squad. There are occasions when something long promised is finally delivered. Call it a coming of age, a breakout moment, or whatever you like, those times are special. Today delivered one of those moments. There are two boys at Dartes whose 200m pacing can best be described as fast-slow-slow-whooosh! Time after time Joe Litchfield (Spa) is told to work the middle of a 200; time after time he falls asleep and wakes up just in time to bring it home with a 50m pb. Today, Joe took one giant leap towards being the superstar swimmer we all know he can be. In the 200bc he went out fast and was more or less first at the 50m. Nothing unusual in that, except normally that would be it, at least for another minute or so. But not today. That 50m was just the opening salvo. Out of the turn he pushed harder! By the 100 he'd built himself a healthy lead and looked in total control. Emerging from the 150 turn he sneaked a look left, then right, admired his 3 or 4 metre lead and dug deep to hang on for Gold from a rapidly advancing Sam Budd from CoSheffield. This time there was no record breaking finish desperately trying to catch Blake and Sam. This time there was just a Gold medal waiting to be hung around his neck. As his proud father said afterwards: "That's the first time I've ever seen him work the middle of a 200!". Great swim joe, great win! Hey come back! We've not finished with the breakout Backstroke swims yet. Those of you keeping up with events at Dartes will be aware of the rapid progress made by our Junior Development Squad. The objective for 2009 was to increase participation at this month's Yorkshires, we were quietly hoping for one or two medals along the way. Last weekend Ben Long (Arm) got the ball rolling with Bronze in the 200IM. Today, a Gold for JDS saw Dartes clean up in the 9/10 years 200m Backstroke. Following Joe onto the podium with another Gold medal performance was Mark Beech (Spa). An outstanding performance and testament to the hard work being done by Doncaster's young stars of the future. Keep your eyes on this young lad, he's sure to be back again. If those 2 Golds were a little unexpected, surely the Girls 200m Breaststroke was a sure thing? No one was going to beat National Finalist Sophie Taylor (Arm), right? She entered Senior Yorkshires earlier in the month to face stiffer competition. Who knew she'd find it right here in her own age group. Sophie had a fight on her hands, and she knew it! If there was any doubt in anyone's mind that there was a battle fast approaching, that disappeared quickly in the heats. A nervous Sophie decided to take qualifying easy -- her place in the final almost certain and an exhausting 400m IM to follow later. Her Cleethorpes and Scunthorpe rival on the other hand, took the opportunity to set out her stall, and set it out she did. Looking ominously strong throughout and finishing powerfully. Worth noting that Leah also had the 400m IM later -- which she won! Sophie would finish that event as a beaten finalist. With qualifying out of the way, options were discussed and it was decided to take the race out hard and try to break Leah. Risky tactics: was Sophie strong enough to break her; is it even possible to break a tough, National level, 400 IMer; if she failed could she still hang on for Silver? From the start Sophie pushed hard. By the 50m turn the surprise early offensive had earned her a small lead, agonisingly small. Leah was clawing back all the way down to the 100m turn -- they touched together. Half the race gone, and they were right back where they started -- head to head. Again Leah went with her. Afterwards Sophie would say: "I went out sooo fast and knew I couldn't slow down". The pained expression on her face as she said that spoke volumes. By the final turn she'd earned herself a small cushion, and it grew and grew down the final 50m as Leah visibly gave in; her mind perhaps focused on her favoured 400IM later in the day. It certainly won't be that easy at Nationals, not that easy was the word on Sophie's lips afterwards. A risky strategy turned into a 4 second PB and a surprise National Qualifying Time as she touched in 2:44. An awesome performance, well done. Upset of the day -- averted! 2 surprise Golds, a surprise national time and we still haven't heard from Max yet. What did he have up his sleeve for today? How about a repeat of his NQT for 400m IM? Sure, no problem. In a race that saw CoLeeds' stand-out, Matthew Johnson, smash the GB age-group record, Max Litchfield (Spa) was only 11 secs behind! That might sound a lot, but just a year or so ago he was trailing the GB standard setter by more than 30. Either way it was close enough to pick up the 14 yrs Gold medal. What he did next was pretty special. From no where near, and completely out of the blue, he suddenly dropped over a second on his 100m Freestyle. The result was a 57 point to earn him the second completely unexpected NQT of the day. Simultaneously causing major headaches for Head Coach Andrew Wallace who must now figure out how to implement a taper for a swimmer who's already dropping time like stones in the middle of a hard training cycle! 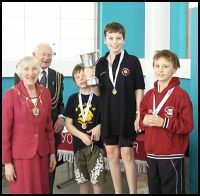 Max was joined in the final by Richard Lee (Spa) who dived in mere minutes after winning Bronze in the 200m Fly. He performed extremely well to get close to his heat time and now has 3 months to emulate his team mate and hit his NQT. Richard also competed in the 400m IM a heat before Max. A 16 sec PB allowed him to dominate his heat from the Fly till the very end and earned him 5th place overall. Prior to blasting out the 200m Backstroke, Joe Litchfield also had a crack at the 400m IM. Who knows what the result would have been had he followed a similar pacing strategy, as it was he also came home in 5th. We're still not a big team, but we certainly make our presence felt. Those who aren't yet winning medals and recording NQTs are improving month by month and threatening to get in on the act soon. The 400m IM is probably the toughest event there is, so it's good to see two of our 14 year old boys and a 13 year old girl making finals. But just as good is seeing 11 year old Jack Green (Tho) get stuck in and record a massive PB. If it hadn't been for Sophie's breaststroke, the gutsiest swim of the day award would have been handed to Rachel Grainger (Spa) on a plate decorated with ribbons. Qualifying for the 200m Freestyle final 3rd fastest (itself a 1 sec PB), she led the final right from the start. Looking strong at the 50m turn, she built on her lead heading for 100m. But as everyone knows, the 100m turn is were the big guys make their move and Rachel paid for the early pace. One by one they reeled her in. One by one they inched passed her. She kicked hard and dug deep and desperately tried to hang on. Unfortunately, a further 2 sec PB was only good enough for 4th. A truly courageous swim and a big PB as prize! It's always nice to see swimmers coming back from frustrating injuries and looking like their old selves. We've seen it with Max and to a lesser extent with Richard. These Yorkshire Championships now look like they're marking the return of Jamie Clarke (Arm) too. Jamie managed two fantastic PBs last weekend, and he followed those up with another two today. Under 1:10 for 100m Freestyle for the first time with a 1:08, he followed that up with a cracking 200m Backstroke too. Asked for a few words to describe his performances today, he said: "I'm Back!". Let's hope he's right. Another 12 year old needing a confidence boost is the other James, James Mullen (Arm). A solid 2:48 200m Backstroke should do just that. Another fine performance. But our top performing 12 year old recently, kept up his good form. Luke Shpylka (SAS) earned his reward from all the early morning training to reach the final. Once there a solid performance earned him 5th place. Luke also kept us waiting in the 100m Freestyle. 5 heats went by before his time was beaten by another 12 year old, earning himself another final berth and making him a regular county finalist! Luke's training partner Heidi Smith (Ros) produced another surprise, qualifying for the 200m Breaststroke final and only narrowly missing the 200 Freestyle too. 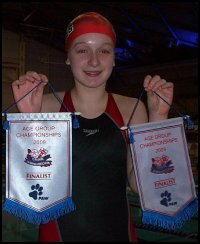 27 Feb: In April the Sunderland Aquatic Centre plays host to the England Age Talent Programme: North East. Our very own Sophie Taylor (Arm) has been offered a place on this prestigious one day camp. The objective of these skills based sessions is to develop talented young swimmers from National finals to podium positions and beyond. In the North East, the programme is co-ordinated by former Kingston upon Hull Head Coach Dave Legge. The camp's head coach will be Richard Denigan from the City of Leeds with skills coach Nathan Hilton also on board. With Max Litchfield (Spa) freshly returned from a Yorkshire training camp in Barcelona, and now Sophie's selection for this camp, it's yet another high profile feather in the cap of Dartes and Doncaster Swimming in general. 25 Feb: For the last few weeks, Tuesday night training has epitomised the progress Dartes has been making recently. Back in its heyday, the club regularly had enough coaches on deck to provide 3 or 4 across the 6 lane pools of St James and Adwick. That is undoubtedly a major contributor towards the success that Dartes enjoyed in those years. In its recent history that had dropped to just 1 or 2 coaches to cover an entire 6 lane pool. Tuesday nights in 2009 are turning into a veritable who's who of Doncaster's coaches. For the last few weeks you could have counted 7 coaches on deck at St James and that looks set to continue into the near future. These aren't just qualified parents dragged down from the balcony to help either, these are high profile coaches from across the range of Doncaster's clubs. Out of those 7, all but 1 has been head coach of one of Doncaster's clubs. 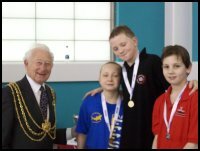 4 of them have also grown up swimming for Doncaster's clubs and representing Dartes too. It's starting to look like the beginnings of a home grown dynasty taking shape at Dartes. In the middle of the pool is Dartes head coach Andrew Wallace, himself a lifelong swimmer with Edlington ASC. Andrew has been instrumental in turning around Dartes' fortunes over the past 2 or 3 years. Insisting on technically skilled swimming, coupled with the latest sports science backed training methods, and adhering to British Swimming's Long Term Athlete Development model, he is guiding the squad towards more and more success and building itself a top-class reputation throughout the North East. Over on the far side of the pool is Assistant Coach Dave Cuthbert with responsibility for Phase 4 (the age group squad). Dave is a former Head Coach of Edlington ASC and was actually Andrew's coach towards the end of his swimming career. He has 19 years of coaching behind him, first at Doncaster ASC, then at Edlington ASC and has been part of the Dartes coaching team for most of the past decade. Assisting Dave with Phase 4 on a Tuesday evening, is another former Head Coach. Phil Hughes, originally a Dartes swimmer with Armthorpe, then until recently Head Coach of Dearne Valley, is a level 3 coach with so many CPD course credits under his belt that the ASA must be wondering how many courses they've held. Brimming with enthusiasm for the sport, we hope to see Phil take on more coaching responsibilities over the coming months. On the near side of the pool can be found the second Dartes Assistant Coach, Kevin Nicholas. Kevin has been Head Coach at Spa Askern for most of the recent past and has orchestrated that club's rise to the very top in Doncaster Swimming. He steered them to victory at last year's DMASA Championships and guided the club to the top spot in Division 1 of the Pocklington League for the second year running. Kevin is another former Dartes swimmer and has the medals to prove it. Working alongside Kevin with the Junior Development Squad is Adwick's Head Coach Neil Stephenson. Neil's coaching helped guide Adwick back in to the top division of the Pocklington Times League for the 2009 season. They're set to do battle with Kevin's Spa squad and Armthorpe in a top division dominated by Doncaster clubs. Neil also assists Kevin with the JDS on a Sunday afternoon and has rapidly become a key member of the Dartes coaching team. Another experienced pair of hands working alongside Kevin is Edlington's current Head Coach Jeff Squires. Jeff first coached with Dartes in the days of Mick Gartside 6 or 7 years ago and has since coached extensively at South Axholme and Edlington before taking up the reins at The Stingrays this year. The 7th member of the coaching team from Tuesday night is the ever popular Derek Fretwell. Although never a head coach, Armthorpe's Derek has probably spent more hours watching top class swimmers in his role of meet official than anyone else in Doncaster. He's been a regular on the Dartes poolside for nearly 10 years and appears to officiate at every open meet or championship in the North East. Although he's now reducing his involvement, he still pops along on a Tuesday night to lend his vastly experienced hand. During the rest of the week, various other coaches help run the show. Another of Doncaster's Head Coaches, Vicky Norman from Rossington (also Regional Development Officer for the North East ASA), assists Kevin with the JDS on a Saturday morning. Armthorpe's Thea Wilson, another former Dartes swimmer, makes it 3 on deck for the Hall Cross session. For most of the week, Dave's Phase 4 squad also benefits from the dedicated assistance of Armthorpe's John Smith. His role is invaluable in helping new members of Phase 4 adapt to the extra training load required of them. As the table below summarises, there aren't many of our clubs not represented on the Dartes coaching team these days. It is, once again, becoming a truly Doncaster wide training programme supported by experienced, enthusiastic, and of course, well qualified coaches. It's always interesting to see how many swimmers each club has coming through the Dartes programme. The table below is a snapshot from last night's register so the numbers will fluctuate slightly each week. The Spa/Armthorpe bias in Phases 4 and 5 is likely to remain for a year or two yet, but a quick look at Phase 3 suggests that the correction has already begun. With a small army of swimmers in Phases 1 and 2 looking to progress forward soon, and a similarly balanced mix of clubs represented throughout the JDS, the future is looking extremely healthy. We are keen for even more involvement from Doncaster's clubs though. Any more of Doncaster's coaches who wish to get involved, no matter how casually, are always welcome. Back in 1993, a Dartes boy won the 14 years 200m Freestyle trophy at Yorkshires. By the time he'd hung up his goggles Greg Viercant (Arm) had reached a National final in every stroke except Breaststroke (inc. IM) and covered all the distances on the programme in each of those strokes. He won National medals of each colour and claimed a Yorkshire and North East record that still stands today! and Dartes' total so far upto 9. Despite the prestige associated with the Yorkshire Championships, this meet is still essentially a mid-cycle training meet. With many swimmers in heavy training and no taper in sight before the Sheffield Premier meet still a month away, the Yorkshires are about racing tough and hanging on. For today's débutante, 10 year old Kelsey Wilson (Adw), an enjoyable baptism of fire. Her first Long Course meet saw her attempt the 200m Butterfly for only the second time. Lesson of the day: Long Course swimming is tough! Despite a DQ for a minor stroke infringement Kelsey battled hard and gave a gutsy performance. Her smile afterwards suggests a future attempt at this most painful of events is definitely on the cards -- here's hoping and well done Kelsey. One year older and the other debut girl jumped straight in with both feet. Freshly moved up from JDS into Phase 4 Caitlin Dixon (Arm), grabbed the bull by the horns in both the 11 year olds events of the afternoon. A strong opening swim in the 200m IM gave her a solid berth in the final alongside 11 year old veteran Shannon Dodson (Spa). At the 150m turn in the final Shannon looked to have the Bronze medal within reach but was narrowly pipped at the post. In the 100m Backstroke Caitlin swam superbly yet again to secure a spot in another final. Shannon also looked very strong to claim her final spot, and the pair were joined by last year's NER finalist Heidi Smith (Ros). Three 11 year old Dartes girls in the final and the question few dared to ask was: how many medals could we grab? The established pair were right on the pace heading into the final 25m. Caitlin wasn't far behind either, but a medal appeared out of reach. A gutsy final 10m saw Heidi sneak a silver while Shannon just dropped out of the running. Lesson of the day: hard work in the training pool may leave you feeling tired and slow mid-cycle, but it also gives you the ability to finish your races hard! Max's age group seems somewhat injury prone. Hopefully Max has seen the last of his problems, but with various bones snapping throughout the Dartes team over the past few months and most of them affecting the 13/14 year old boys team we can only wonder what will happen next. What happened today though was encouraging. Marking his return from breaking something (I forget what, there have been too many) Richard Lee (Spa) raced back-to-back 200m Freestyle and 100m Butterfly finals within minutes of each other. The result was a fine Bronze medal in the Fly to go with his pre-breakage Silver at last year's NERs. There were many more high spots and medals on day 1. This is a sneak preview while we wait for the results to be published. Earlier this evening we received the following email from Clive Parrish concerning his father. Please pass the information on to anyone who might be interested. In the late 60's and early 70's I was a member of Doncaster ASC and was a National Age Group Finalist for 4 years as well as being a NE Counties Age Group Champ for 6 years. My Dad Derrick Parrish was a Club Coach and a driving force in the creation of DARTES. Sadly, he died earlier this week and his funeral is next Friday 27 February at Rose Hill Cemetery (12.40). I no longer have any contacts within Doncaster Swimming but there may be people who have been involved and may even have their own children in your squads who were coached by my Dad. My brother and I wondered if there is anyway you can let people know of his passing? On other matters I am, for my sins, the Chairman of the Isle of Man Swimming Association and I am impressed with the programme you now have in place -- swimming in Doncaster has come a long way since the days when we had to train at 7am in public sessions and a Thursday Night for half an hour! Happy memories! 8 Feb: At the Senior/Junior Yorkshires a strong performance by Niall Wainwright (Spa) to lead off the men's 200m Freestyle team saw him sneak under his 50m Freestyle National Qualifying Time. His time was 25.47. Apologies for the old photo Niall, it's the only one I have of you. Another National time was recorded by Sohpie Taylor (Arm) in the 100m Breaststroke. Sophie finished 6th in the final with a time of 1:17.56. She chose to swim the Senior/Junior Championships (well above her age group) in order to experience tougher competition on her build up to Nationals in the summer. She also battled hard in the 200 IM in this same age group, finishing 30th. The Honours Table will be updated after the Yorkshires are completed in March, but a few new names need adding after this weekend. He qualified for Nationals a few months ago and Danniel Warrener (Arm) continued swimming well for a Bronze medal in the 100 Freestyle. Sophie Coy (Adw) picked up another 3 Bronze medals (2 Junior and 1 Senior) for her Butterfly swimming. Katie Lindop (Spa) also earns herself a spot on the Honours table with a Junior Bronze in the 50m Backstroke. She's already earned her place on the table, but Emma Humphreys (Ros) consolidates her position with her Junior Bronze for the 200m Butterfly (just missing out on Senior Bronze too, in 4th place). Making it 6 Bronze medals for Dartes. Overall, the event was dominated by Plymouth College. According to our on-site reporter, the highlight of the day occured during the first medal ceremony which was accompanied by the tune "The Stripper"! Ooops, a small oversight perhaps. As always our schools swimming reporter was Julie Hirst. 2 Feb: With the weather predicted to be "Freezing Snow" all weekend, it was good to know that the DARTES swimmers competing at this year's Harrogate Open were feeling pretty HOT. It was with great expectation that DARTES entered the Harrogate HYDRO, ready to do battle in the Short Course arena. Heidi Smith (Ros), set the ball rolling in magnificent fashion, claiming GOLD in the 200m Backstroke (11yrs). This set the trend for the rest of the weekend with a tremendous 48 medals coming the way of DARTES from only 110 swims over both days. 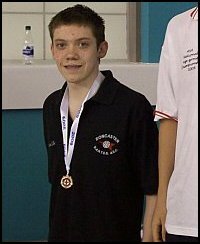 Max Litchfield (Spa) produced an almost flawless display of swimming with a solitary Silver (200m Free), to go with the other 7 Golds, that he claimed. However to make up for this disappointment, he went on to claim not 1, but 2 National Qualifying Times. 1st in the 400IM (Sat) and then in the 200m Back (Sun). Well Done Max, an excellent weekend. 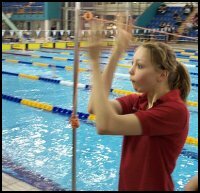 Not to be outdone by Max, Sophie Taylor (Arm), went on to claim 6 Gold and 2 Silver medals from her 8 swims, proving in the process that she is currently No1 at Breaststroke by claiming Gold in ALL 3 Breaststroke events. Well Done Sophie. 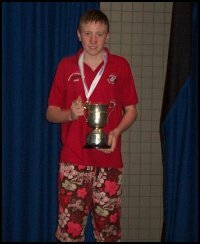 Joe Litchfield (Spa), managed to complete a family set of medals by claiming 8 medals from 8 swims. Well done Joe. Jarvis Parkinson (Tho), also picked up a Gold medal for the 50M Free, with another display which outlines why he is the Yorkshire Champion at 50M Free. His 8 swims also included a brave 5th place in his first 400m IM. Well Done Jarvis. Cherelle McPherson (Adw), completed the Gold rush by taking the 100m Butterfly Crown. Well Done Cherelle. The following swimmers also deserve a mention, claiming medals throughout the weekend: Matthew Davies (Arm), Keagan Guest (Spa), Laura Hirst (Edl), Emma Humphreys (Ros), Holly Lewis (SAS), Katie Lindop (Spa), Niall Wainwright (Spa), and Daniel Warrener (Arm). "Without YOU, it wouldn’t be worth watching"! Many thanks to our first guest contributor for 2009, Andy Elstub (kindly volunteered by his son Keagan who made absolutely no effort to pretend that he was going to write it himself -- shame on you Keagan).